On January 6th, students and faculty of the Yeshiva had the opportunity to hear a lecture from world-renown mathematician, Rabbi Dr. Leon Ehrenpreis. Dr. Ehrenpreis opened our eyes to a new means of synthesizing the Creation story with modern science, revealing how the views of our Amoraim regarding Creation correlate seamlessly with the major theories of primordial matter-formation posited by modern-day scientists. 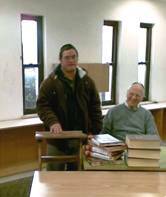 Following a heartfelt introduction by his son, Saadya Ehrenpreis, a student of Yeshivat Darkaynu at Yeshivat Har Etzion, Dr. Ehrenpreis began by showing how the use of the past perfect tense in the preliminary pesukim of Bereishit indicates existence prior to G-d's creation (yeish m'yeish). Yet we know that G-d created the world ex nihilo (yeish m'ayin)! We must understand, Dr. Ehrenpreis maintains, that Creation is yeish m'ayin from our human perspective, which is limited by the extent of our knowledge; but, Creation is yeish m'yeish from the omniscient perspective of G-d. With this in mind, we can begin to tackle this complex subject. Dr. Ehrenpreis quoted the gemara in Mesechet Yoma (54b) in which Rabbi Eliezer and Rabbi Yehoshua dispute as to how the first physical matter came about when G-d created the world. Rabbi Eliezer says “olam m'emtza'ito nivrah”, “the world was created from its center.” This is known as the theory of even shetiya, which states that there existed a “rock of Zion”, a dense, central body of matter from which the world shot out. Sound familiar? Rabbi Eliezer's view corresponds with stunning accuracy to the Big Bang theory! Rabbi Eliezer's opponent, Rabbi Yehoshua, maintains “olam min ha'tzdadin nivrah”, “the world was created from its sides on.” This theory says that the world was filled with bits of matter which gradually grew closer together and then coagulated to form the universe. Again, we see an Amora in agreement with today's scientists – Rabbi Yehoshua paskins according to the theory of Intergalactic Condensation, the second major theory of Creation put forth today. Modern-day disputes regarding the creation of the world thus mimic and reflect those of our own Jewish tradition. Quoting from his personal discussions with world-famous scientist Paul Adrian Durack, Dr. Ehrenpreis explained that much of the scientific community's reluctance to accept the synthesis of Torah and science comes from the fact that today's calculations which aim to determine the age of the universe yield conclusions inconsistent with Torah. Yet these scientists employ mathematical and scientific constants (such as the speed of light) whose value may have changed over the course of time. Dr. Durack and Dr. Ehrenpreis tout the idea of changing constants, that constants employed today may have very different values than those of thousands of years ago. Calculations are thus thrown greatly askew, and their inconsistency with Torah is no proof. As evidenced by the captivated faces of everyone in the Moadon, Dr. Ehrenpreis was an engaging speaker, and the students and faculty of Gush feel honored to have been able to learn from him.